To Cite: Khoundabi B, Kazemnejad A, Mansourian M, Faghihimani E. Factors Associated With Serum Albumin in Diabetes Mellitus Type 2 With Microalbuminuria Using Non-Normal Mixed Models: A Prospective Cohort Study, Iran Red Crescent Med J. 2016 ; 18(1):e20671. doi: 10.5812/ircmj.20671. Background: The globally increasing epidemic of diabetes will lead to serious problems including diabetic nephropathy and kidney diseases in near future. The first clinical diagnosable stage in a diabetic kidney disease is microalbuminuria (urinary albumin excretion of 30 - 300 g/24 hours). Objectives: This prospective cohort study investigated the risk factors of microalbuminuria in patients with type 2 diabetes who had been registered in endocrine and metabolism research center in Isfahan city, Iran. Patients and Methods: This prospective cohort study was performed on 90 diabetic type 2 patients with microalbuminuria, who were selected according to the consecutive sample selection method during 6 years. Data were collected through regular and systematic measurements of serum albumin as the response variable and body mass index, systolic and diastolic blood pressure, the duration of diabetes, glycosylated hemoglobin (HbA1c), total cholesterol, triglyceride (TG), fasting blood sugar (FBS), low-density lipoprotein (LDL), and high-density lipoprotein (HDL) as the related factors. Non-normal mixed models were used to investigate the impact of effective factors on the amount of excreted serum albumin. Results: According to the deviance information criterion (DIC = 56.2), the non-normal mixed effects model with the skewed t distribution had a best fit and indicated that HbA1c, HDL and total cholesterol had a significant effect on the amount of albumin in urine (P < 0.05). Conclusions: Using nonnormal mixed models may lead to the best results as compared to common normality assumption. The world health organization estimated that until 2030, over 350 millions of people will be suffering from diabetes especially among patients with diabetes mellitus type 2 (1). Diabetic nephropathy and affliction with cardiovascular diseases are among the known side effects of diabetes and initiation of microalbuminuria in diabetes type 1 is an evident sign of progress towards nephropathy (2, 3). Moreover, microalbuminuria is closely related to the death rate of patients with diabetes type 1 and 2, as it increases mortality caused by cardiovascular diseases (4, 5). Microalbuminuria, especially in diabetes mellitus type 2, is recognized as a strong predictor of macrovascular complications and the overall mortality due to the increase in both cardiovascular and all-cause mortality. Microalbuminuriais defined as a urinary albumin excretion of 30 to 300 mg within a 24-hour period (6, 7). American diabetes association suggested an annual screening of microalbuminuria and nephropathy in all patients with diabetes mellitus type 2 (8, 9). Since the probability of occurrence of microalbuminuria is on the rise among diabetic patients, the discovery of the role of its risk factors seems essential. In order to investigate the risk factors involved in microalbuminuria, a meta-analysis was conducted on 1,243 published academic articles (2000 - 2009). A relationship has been documented between microalbuminuria and a number of risk factors including fasting blood sugar (FBS), body mass index (BMI), glycosylated hemoglobin (HbA1c), the duration of diabetes, waist circumference, lipid profile, age, gender and smoking (10). Logistic regression analysis in a cross-sectional study showed that established microalbuminuria was associated with male gender, diabetes duration, HbA1c, systolic blood pressure (SBP), smoking, BMI and triglycerides (TG) in both types 1 and 2 diabetic patients, and with HDL in type 2 subjects. Overall, 39.2% of the Asian patients with diabetes had microalbuminuria (8). Documents on microalbuminuria in Iran presented that the prevalence of microalbuminuria among patients with type 2 diabetes is 25.9% which is significantly higher than the global rate which is 8% (11). The present research has investigated the effect of factors which caused changes in the amount of serum albumin in type 2 diabetic patients with microalbuminuria based on a 6-year prospective cohort study in Isfahan’s endocrine and metabolism research center (IEMRC), Iran, which is a state and academic institute. Mixed models are most advanced and useful in the analysis of repeated measurements. Normality of random effects and residuals has been the common assumptions of modeling in longitudinal data. They have always obsessed the researchers’ mind and even raised doubts (12). Therefore, the use of mixed normal distributions or any other heavy-tailed distribution in recent years has been welcomed by researchers. The present research dealt with fitting of the mixed models taking into account non-normal distributions. The consecutive selection method was used to select the subjects. All accessible diabetic patients (n = 1590) whose names had been registered in Isfahan’s endocrine and metabolism research center, Iran, were entered this study, from June to October 2007. All patients submitted written consent to participate and the ethics committee of Isfahan university of medical sciences approved the protocol. The study abided by the current version of the Declaration of Helsinki. After a screening program, patients with microalbuminuria (n = 390) were selected to be tracked for 6 years, from October 2007 through October 2012. Microalbuminuria was defined as a urinary albumin excretion for 30 to 300 mg over a 24-hour, in two out of three random spot urine collections during the three months prior to the study. Inclusion criteria were affliction with type 2 diabetes, being above 35 years of age and residing in Isfahan. Those patients who had overt nephrotic syndrome or cirrhosis, breast and prostate cancer, diabetes type 1, who had a febrific or nonfebrific infectious illness one month prior to the study and who had congestive heart failure were excluded. Finally, all patients who were left (n = 90) were selected to be tracked for 6 years. The purpose of the study and the voluntary nature of participation in the research were explained to the participants. All participants were assured on data confidentiality. Participants were traced since the diagnosis time till the end of the research. This study investigated the effect of the variation of variables such as HbA1c, BMI, LDL, HDL, total cholesterol, TG, DBP, FBS, and the duration of diabetes on the amount of serum albumin. Body mass index was estimated in weight divided on height2 (kg/m2). Duration of diabetes was obtained through interview in which age at diabetes diagnosis was subtracted from the baseline age. Cholesterol levels were assayed by a colorimetric assay at 540 nm using cholesterol esterase and oxidase as adapted to the dry slide technology used in Vitros 500 and 250 chemistry analyzers. Urinary albumin was measured by radioimmunoassay (Sclavo Kit).Blood pressure was measured twice at ten-minute intervals and patients were sitting for at least five minutes before the measurement. It was measured in both arms using a mercury sphygmomanometer (Yamasu, Japan); In case a disparity in measurement was observed, the higher value was recorded. The diastolic pressure was determined at Korotkoff phase V. Hemoglobin A1c levels were measured using affinity chromatography (Isolab, Akron, OH). High-density lipoprotein levels were determined using a phosphotungstic acid precipitation step. Fasting blood sugar levels were measured using an autoanalyzer (Accu-Chek Advantage®) glucose kit. Where, Yi =Yi1, …, Yini)´ and εi are ni-dimensional vectors of errors and independent of αi. Xi, Zi were known ni × ρ and ni × q full rank design matrices corresponding to β and αi. We proposed the skewed versions of multivariate elliptical distributions for the random effects of model (2), suggested by some authors (13-15). A k-dimensional random vector Y with multivariate skew-elliptical distribution denoted by SEk (µ, ε, D, gθ) with k-dimensional location vector µ, k-dimensional scale matrix ε, k-dimensional skewness matrix D and density generator function gθ. Skewness matrix D is a diagonal matrix produced by D = diag (δ1, …, δk). The density of Y will be positively skewed (resp. negatively skewed) for δi > 0, i = 1, …, k (resp. δi < 0, i = 1, …, k). Location vector, scale matrix, skewness matrix, and density generator function in formula (3) (16), respectively were Xiβ + Ziα, Si, Dei, and gniθe, also in formula (4) they were respectively 0,ψ, Dα, and gqθα.We considered the Bayesian approach to statistical inference under model (1), focusing on some symmetry and asymmetry distributions such as normal, t , Slash, and Laplace for random effects that have recently received considerable attention in statistical literature (15, 17-19). Bayesian specification of the model needed to consider the prior distribution for all the unknown parameters. In all models of interest, prior distributions for fixed effects, β scale matrix of random effects ψ were modeled respectively using multivariate normal distribution Np (β0, Sβ) and inverted Wishart. In this study, Si was set σe2I, where I was the identity matrix ni × ni. The software OpenBugs 3.2.2 (http://www.mrc-bsu.cam.ac.uk) was used for data analysis and estimation of unknown parameters. Deviance information criterion (DIC) was used for model selection. In this study, 42.6% of the participants were male and 57.4% were female. Their age ranged from 35 to 68. The highest frequency (46 patients) belonged to the age range 50 - 59. Their average diabetes period was 8.04 ± 2.45 years (Mean ± SD). In the beginning of the study and before the follow-up time, all the patients were assessed for biochemical data including total cholesterol, HbA1c, HDL, LDL, SBP, DBP, BMI, FBS, and TG. The means and standard deviations of some of the variables which were used in the modeling, at the outset and during the study have been reported in Table 1.The mean follow-up duration was 4.9 years while the mean repetition frequency was 4.6 per patients. In the follow-up period, 15 patients died because of cardiovascular diseases in the last two years and 5 others died for other reasons. 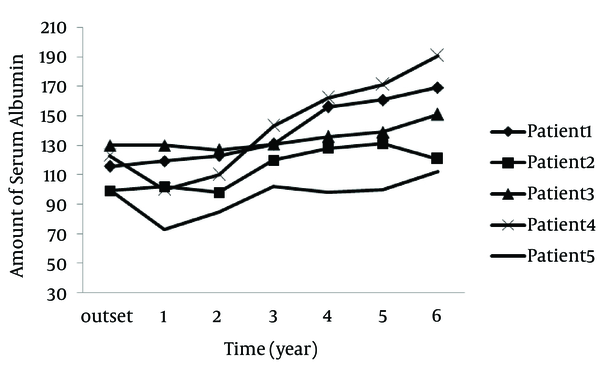 A longitudinal profile in serum albumin value was measured repeatedly over time in the dataset for five randomly selected patients, as shown in Figure 1. We implemented the models with different combinations of symmetry and asymmetry distributions for random effects. In the Bayesian Markov chain Monte Carlo (MCMC method, we used 10,000 iterations after discarding the initial 2,000 iterations. To avoid the autocorrelation that appeared in the generated chains, the lagged value was set to 5. Nonparametric Kolmogorov-Smirnov (KS) test was used in realization of normality of random effects and residuals. The results are presented in Table 2.Variables HbA1c, HDL and cholesterol indicated a significant effect on the amount of serum albumin based on 95% probability intervals not including the zero value. Among patients with microalbuminuria, there was an increase in the amount of serum albumin with an increasing cholesterol and HbA1c. In addition, the results showed that low HDL was associated with the increasing amount of serum albumin. A model with t-skew random effects was the best model according to DIC. aDistribution of residuals and random intercepts in: model (a) normal and normal, model (b) skew-t and skew-t, model (c) normal and skew-slash, model (d) Laplace and skew-t.
bSignificance of the effect at the significance level of 5%. Microalbuminuria occurs far earlier than the appearance of the clinical syndrome of diabetic nephropathy (6). After 10 years, 50% of patients afflicted with diabetes move towards macro-albuminuria. Considering this, the present paper offered a method which entails the modeling of the amount of albumin in the presence of independent variables such as HbA1c, BMI, duration of diabetes, DBP, HDL values, and cholesterol. It also investigated distributions other than the normal ones for the random effects of the model. In all models which have been studied the effect of HbA1c showed a positive effect on the amount of albumin. In some studies aiming to investigate the relationship between HbA1c and the excreted albumin in diabetic patients a positive correlation was found between these two variables (1, 20, 21). However, the present study showed no significant effect for diastolic blood pressure on albumin similar to some other research (4, 20), but in some studies there was a significant difference in the blood pressure between microalbuminuria and normoalbuminuria groups (6, 9, 22, 23). In an extensive research carried out on patients with diabetes type 1, it was showed that maintaining systolic blood pressure at lower than 140 mmHg can slow down the development of Micro- to macro-albuminuria (24). Generally, an increase in BMI implies an increase in albumin excretion rate, as well (25). The present research confirmed this trend though the relationship found was not significant. In the examined model, HDL and cholesterol also showed a significant positive and negative correlation respectively with the amount of excreted albumin. In our study, investigating the effect of LDL, FBS and triglyceride was not significantly correlated with the amount of albumin and the findings were similar to the meta-regression study in 2012 on the risk factors of microalbuminuria. The correlations of age (higher ages) and gender (male) with microalbuminuria were found to be in the intervening variables (8) which was not confirmed by the model in this study, but more attention should be paid to examine and diagnose the risk factors among the elderly male patients, since they are more susceptible to microalbuminuria. Although the correlation between the duration of diabetes and the amount of albumin was not significant in the present study, this variable has been introduced as an important risk factor of microalbuminuria for patients with diabetes type 2 in other studies. Diabetes type 2 has become a wide epidemic among children and teenagers. The focus of such programs should be on taking greater care of children since school age. It is suggested that people older than 12 who are afflicted with diabetes be annually screened for microalbuminuria, because screening hypertensive subjects for microalbuminuria may become an important part of the management of hypertension, too (25). Patients with diabetes mellitus type 2 are more liable to death as a result of cardiovascular diseases. This hazard gets more serious among patients with microalbuminuria. Preventing the expansion of microalbuminuria is a key action in controlling nephropathy, retinopathy and cardiovascular diseases.The strength of this study lied in the medical novelty oftracing patients with microalbuminuria for the first time. Its weakness, however, is that its sample size was not large enough. The authors are grateful to the reviewers for their constructive comments that improved the manuscript. The research was partially supported by Isfahan endocrine and metabolism research center, Isfahan university of medical science, Iran. Authors’ Contribution: Batoul Khoundabi carried out the design and coordinated the study, run all modeling studies and prepared the manuscript. Anoshirvan Kazemnejad provided assistance in the design of the study, technical advice on modeling and revised the manuscript. Marjan Mansourian provided assistance for all statistical results. Elham Faghihimani coordinated and carried out all the experiments and provided the technical advice on medical discussion. All authors have read and approved the content of the manuscript.